Poor David Rollins. Isn’t this his 5th team this offseason? Teams that claim Rollins should be required to keep him on their 40-man roster for two months. Amazing comeback, seriously, that was the greatest thing I’ve ever read! Can you comment again?! Whys that? Oh, you’re able to see that championship trophy being carried around right? If I wanted my come back I would have wiped it off your mom’s chin. Good one. How old are you, like 12? Next time you think you have a clever quip, just save it. Not your forte. Actually, I’m 27, and read MLBTR when I take a dump. Unlike so many on here that sit in their moms basements all day playing video games and have a computer right next to them. Still doesnt make you better than anyone else. That’s right. You sit in your grandma’s basement all day doing that. Didn’t say I was better than anyone else, thanks tho! Look out everyone, we got a badass over here! Just get out of class and mommy give you your phone when she picked you up? Yeah, I’m totally one. That’s all I claim to be! Unlike you, I have a life. I don’t live by my computer just waiting for people to reply to me on MLBTradeRumors. I say it because it’s true. From the amount of time you spend picking fights with randoms on MLBTR you clearly don’t have any of those things. And your guestimation of my age is far from accurate. Idk where you got the idea that I am in 8th grade. Perhaps you spend too much time underwater and got water in the brain. Is that it? You can always use that as an excuse to explain your overt stupidity. From the looks of this thread, yes you do pick random fights. You are once again indeterminately wrong about my age. And I thought you said you were out. I didn’t say I would stop responding. I’m just getting warmed up. You on the other hand did and then you came back. You HAVE to keep replying. You can’t help it. And I don’t care how old you are. It doesn’t make you any less pathetic or obtuse. If you actually had a leg to stand on you wouldn’t have to resort to attacking my age. See? You came back again. You have a habit of going back on what you said, but oh well. Oh, you’re back again? Hilarity at its maximum. And you proved my point a long time ago. Give it up dude, you have no argument. Point? What point? All you’ve done is comment emojis over and over again. And no, I’m never giving up. Unlike you I never said I was out so I have the right to keep commenting. By the way, I’m not arguing with you, I’m scolding you. But you can’t tell the difference being the insolent child you are. Stop crying because I’ve embarrassed you. Here’s your pacifier. LOL says the guy who keeps saying he’s done commenting and then coming back. Anyone who sees this can clearly see who the moron is. There’s a reason why other people on this thread are hating on you too. Would you like a bib with that pacifier? Cuz you’re slobbering all over yourself with embarrassment. An infantile tantrum because your diaper is soiled and you are red faced to the hilt. You’re so mad because I’ve revealed your stupidity for all to see. How does it feel? I’m actually not mad. I just think it’s hilarious that you keep going. I’m sorry, I’ll retract my statement about me being done. Happy? Please, continue. I enjoy the laugh. You really are a sad case study in psychosis. Are you really that desperate for attention that you feel the need to seek it out from complete strangers online? That is the definition of being pathetic. Stupidity reigns supreme and you are too sad to realize it because the fool will always be a fool and he is always the last to know. Look in the mirror to see a pathetic image of one. It’s quite evident and everybody posting here sees it except you. seriously though, it is a bit crazy. there ought to be a max # of times you can be dfa’d before you can become a free agent…..realize the guy cant plan too much anyway because he could be in the majors, minors or released wherever he goes for spring training, but if he’s married, his wife must be hard to deal with right now. I agree with you. However, I’ve thought about this before, and I’m guessing that most minor leaguers don’t pick up and move as soon as they’ve been claimed. They probably start to plan, but just that, plan. Because obviously, especially in Rollins case, plans can change in a hurry. Great comeback, go back to watching flavor of love on VH1 classic! I thought Dewees had some decent upside, shame to see him go, but the guy they got for him seems like he could be good with the right coaching. I’m sure they tried. Then 15-18 minutes of Cub laughter, then the Royals said “Fine! Just tell us who we can have.” Deal done. For some bum they just DFA’d? Could this be the next-next Jake Arrieta? In all seriousness, I’m surprised the Royals moved on from him so quickly. He was straight up trash last year, but he has put up really solid numbers in the minors. The chances of that occurring are slim to none. These two are lottery ticket depth that can be optioned and pitch in AAA incase someone gets hurt. I wouldn’t expect them to be fixtures in a contending rotation. Alec Mills may surprise you. He is a good 5th / 6th starter that will give you good innings.. Plus he is coming to his childhood dream team. Providing even more fire in his belly to stick in the bigs. Fact:….Alec Mills made 2 World Series 40 man rosters. . Just sayin…..
butler has a shoulder injury that sapped his velo and has since changed him arm slot that allowed him to have the +/++ change. Maybe he’ll actually help a World Series team this year. None of those three will become permanent rotation guys… they’re AAAA 6th starters at best. A rotation of Hendricks, Mills, Butler and Montgomery would be the worst in the entire MLB. Padres would still be worse. I know this young man personally. He and his family are big Cubbie fans. He is a great person who won’t cause any issues. Hard working. Comes from a good family. As a Philly fan…..time to start buying my Cubs swag!!!!!!! Welcome to the Cubs Alec Mills. @Jabronie Mills is a UT Martin guy correct? Yes he is. Walk on. From Clarksville, TN. Went to HS at Montgomery Central Former St. B Little Leaguer. I’ve had the pleasure of umpiring his games. Ok I’m just asking because his name sounds so familiar from the OVC. The Cubs default is getting good dudes. Dewees is a gem, as well. Every single time the cubs make an insignificant move someone always always says well done Theo. Give us a break! Oh and everything the cards do is fantastic. You are even worse than the terrible cubs homers. Oh was fantastic last year. Montgomery trade was much more high profile than this one. Vogelbach was a decent prospect to give up for Montgomery whereas both guys in this trade will be lucky to even make a major league roster. And Arrieta was a former top 100 prospect with elite stuff, he just couldn’t command his pitches. Not comparable to Mills who has middling stuff. Theo broke two biggest droughts in sports . Red Sox and Cubs . He is kinda good at his job. What about Jed? Why doesn’t anyone EVER give any credit to Jed? Ya he has a fairly low ceiling but even if he’s a speedy 4th outfielder type thats not a bad get for someone they just DFA’d. His hairline is pretty unfortunate though. Man… I kind of like Dewees. I’d be really curious how a 20-30 arm profiles against the average person who pitched/ss/had good arm in hs. A 3 ML arm would still be a slightly below average high school outfield arm. A 2 arm grade example would be; “did this guy used to throw with the other arm”? Hard to hide a two arm grade on a top division ML squad. LF if he is a runner or 1B/DH types. so say someone threw abouta 83 from the mound with a pretty decent and accurate arm from cf, they’d grade better than a 20-30? You would be correct. 83 from the mound in High School isn’t all bad in certain parts of the country. That would definitely be a 3 arm grade or higher for certain ML positions. In grading High School players, Scouts look at arm action and hand speed. This allows the scout the ability to project if a player may or may not be able to throw harder in the future. These grades of course are all subjective to the person’s judgement doing the actual scouting. Completely called this in the post where it says he was DFA’d. Check it out if you don’t believe me. No it’s clear that he’s destined for the pen. Or at least scouts see him clearly as a pen piece. Do not like. I’m all about reclamations at a low cost, but DeWees could easily be another DJ LeMahieu. yeah, no. He plays of and hasn’t made it past advanced A by 23 and didn’t even have a great time there. He’s fast and can sorta get on, bout it. We have Baez and Happ. When would DeWees get on field with Cubs? I can’t say enough good things about the recent moves Theo and team have made for SP depth. Alec Mills, Eddie Butler, Casey Kelly, Brett Anderson, and Mike Montgomery last season – all of them low cost with excellent upside. If just one of them becomes a reliable #5 it was worth it. You’re happy with those moves? Seriously? None of those guys outside of Anderson are capable major league starters. None of those guys outside of Anderson have any upside (and Anderson’s upside is limited). Cubs should’ve gone after someone like Ivan Nova or Bartolo Colon to fill out the rotation. If Mills, Butler or Kelly have to start meaningful games that’s a bad sign. Those guys are really bad. Acquiring a few scrubs is not very impressive in my eyes. Theo should’ve done more to address the Cubs one serious hole: starting pitching depth. That’s what people said about Jake Arrieta and jason Hammel when they acquired them. They also said Hendricks was a fringe #5 starter after 2015. Point being……. people don’t know sh**. If you don’t think Montgomery, Mills, or Butler have any upside at becoming potential SPs, then you are quite possibly the most pessimistic person I know……. which is crazy since people call me pessimistic. Trust me, at the time I thought they coughed up way too much at the time when they acquired Montgomery. Once he got here and sucked hard for the first several outings he had my sentiment toward the deal became even more steadfast. BUT, as the weeks went by Montgomery turned it around. Montgomery overall in 2016 had a 2.52 ERA with a 1.17 WHIP. Between the Mariners and Cubs he started 7 games and posted a 3.28 ERA and 1.18 WHIP with 8.6 K/9 rate…….. granted it’s only 7 starts I’d still say that’s encouraging…….. especially seeing as he only is expected to be a 5th starter. Mills and Butler have the minor league stats to be encouraging to think about their future. Butler is a former highly touted pitching prospect (much like Montgomery) and Mills just has flat out solid minor league stats with a solid K rate and stellar BB-rate. How you can say Mills flat out has no upside after only pitching a grand total of 3.1 innings at the major league level tells me you’re a fu**ing idiot. If I were a betting man I am going to say that You thought Hendricks was a bum after the 2015 season. Also, that after Javier Baez’ pathetic debut 2014 season you were labeling him a bust. Now……. you’re probably telling people how you “knew” Hendricks was something special and that Baez just needed more time. I wish I could tag posts to come back to just to check in later down the road to call people out. 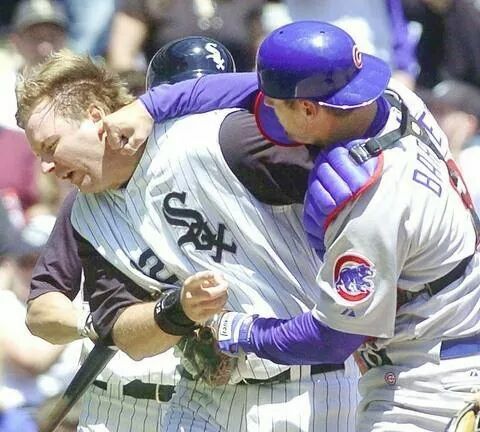 There are SOOOOOO many dumb Cub fans from last offseason saying the team should trade Baez for a pitcher……. now Baez is untouchable to pretty much every homer/meathead Cub fan. I love the Cubs but dealing with this fan base is frustrating as hell. I completely understand why every other fan base mocks the Cubs fan base. They’re full of idiots. There is a LARGE portion of fans who seemingly care more about the sh**y building they play in than the actual team itself. I mean just go online and you can read all about the outrage toward the Ricketts family and what they have done to their beloved summer suntan locale, Wrigley Field. True fans of a team don’t give two sh**s where the team plays or how their stadium looks as long as the team is good. Yet despite winning a World Series you still hear people lamenting over the renovation project…… I KNOW Cub fans who are still lamenting over the changes and I make fun of them every chance I get on how irrational and stupid they are being. It is just a field. Cubs fans seem to get emotionally wrapped up in the dumbest things. Like they seriously get down when bench/utility players get traded away like Mark DeRosa, Reed Johnson, Darwin Barney, Tony Campana, and Augie friggin Ojeda just to name a few. I mean look at their attitude toward David friggin Ross. The guy was a backup catcher…… a third string catcher in 2016. He was here for only 2 years and now there are idiot Cub fans saying he should be the next manager despite having 0 managing experience. They’re idiots. You saying NONE of these pitchers have any upside is just another idiot Cub fan spewing more nonsense. At times I am ashamed to be associated with this fan base. I mean seriously, how the hell can you say Alec Mills who has a whopping 3.1 IP at the ML level has absolutely no upside? Get a clue. I don’t get how you can say none of these guys have any upside but then say stupid crap like they should’ve gone after Ivan Nova or fata** 44 year old Bartolo Colon. Your logic is amazing for all the wrong reasons. Ivan Nova, a 7 year veteran with almost 800 career IP at the ML level who owns a 4.30 ERA, 4.27 FIP, 1.37 WHIP, 6.7 K/9, and 2.7 BB/9……. he has more upside at a cost of $8.67 million on average for the next 3 years compared to all these far cheaper pitchers? Really. Bartolo Colon and his 44 year old 300+ lb a** at a cost of $12.5M has more upside than any of these guys the Cubs have acquired? Really. The fact you name Colon as a better option tells me you must be one of the people who labeled Baez a bust and were unimpressed with Hendricks. Why? Because other than the obvious age issue Colon has he hasn’t been that good. Yes, he had like a 3.43 ERA in 2016 but his FIP was 3.99. His ERA the previous two years if you’d stop looking at just the previous year’s, “what have you done for me lately” stats you’d see that his first two years on the Mets were pretty…… blah. Posting a 4.13 ERA with a 3.70 FIP. That’s not horrible…. but at the cost of $12.5M….. hell no. ESPECIALLY for a dude who will be 44 in May……. and weighs like 350 pounds. I’d take Brian Matusz again over Bartolo friggin Colon. Colon’s mediocre stats are actually really impressive when you consider how many hits and HRs he coughs up each year. The only reason his WHIP is in the 1.20-1.25 range which isn’t awful is because he rarely walks batters……. but he sure does give up the hits. He’s coughed up 200+ hits the last 3 years while averaging 195 IP. As for HRs he’s averaged allowing about 24 each of the last 3 years as well. That’s about .8 HR’s per start. Pitching in Wrigley in the summer and coughing up that many HRs….. yikes. If it’s a hot summer with a lot of wind coming from the SSW Colon would likely give up 30+ HRs. If you would’ve said something like they should’ve re-signed Hammel, or added someone like Fister (still available) or Edinson Volquez. Still those are dumb moves because they traded for Montgomery last year with the intent to make him the 5th starter for this year. Whether you like it or not, Montgomery has promise. Again, I was as anti-Montgomery trade as anyone when it happened. But after several weeks when Montgomery settled down my opinion started to change. Then when he made 5 solid starts at the end of the year my opinion really did a 180. It’s not like anyone is saying these guys are all potential TOR guys. They all just show promise to be back of the rotation starters. With the 5th spot open this year and Lackey likely retiring after this season, but definitely not coming back since his contract is up, they need as many back end arms they can find and the cheaper the better. Why on earth would you want 44 year old Colon at $12.5M to be your 5th starter…… that’s just dumb. This was impressively almost twice the amount of words written in the article above. I won’t reiterate KB’s outstanding commentary. But I’ll summarize in saying that if you think those guys do not have upside, then you are a frinkin’ moron. What do you base this on, ERA at the ML level only? You don’t look at GB%, K/9, BB/9, xFIP, Soft% or anything else? Any idiot can trade half his farm system for a can’t-miss rotation pitcher. But that strategy is not sustainable. Just ask the Oakland A’s. Smart GMs look at a composite of baseline stats that exceed actual on-field results, trade for them on the cheap, and then put them through the Bosio workout. Will all of these guys we’ve obtained turn into productive ML pitchers? Of course not. Rex Brothers didn’t work out. Clayton Richard didn’t work out (though he put up some nice numbers for SD). But Arrieta, Rondon and Strop were all obtained for virtually nothing. That’s the model – obtain 4 or 5 on the cheap and if one of them turns into the next Arrieta, it was a frinkin’ bargain. I like this addition better than the Butler one. Mills minor league numbers are more attractive and favorable to me at least than Butler’s. Butler just gets the hype because he was a former top pick and highly touted prospect…… mainly because he was a top pick – not because of anything he has really done in the minors. Mills on the other hand is a 22nd round pick but has been pretty solid in the minors and owns a stellar 8.5ish K/9 rate down there to go with a sparkling 1.9 BB/9 rate. He has limited experience at any level beyond single A though despite being in their system since 2012. I’m wondering if he battled injuries for a few seasons. I mean why keep a guy in rookie ball or single A form 2012-2015? That’s 4 years at the lowest levels of professional baseball. 2016 was not only his ML debut season but also his double A and triple A debut season as well. He was rock solid in double A but struggled a bit in triple A. As far as his “ML debut” goes…… it lasted 3.1 IP……. I’d hardly consider that a “debut season.” hoping this kid is a diamond in the rough, like so many others this front office has seemingly found in years past. As for the Royals getting Dewees. It’s not a bad pickup for them. As for these “experts” giving Dewees’ arm a 20 and 30 grade on a 20-80 scale…… that’s just ludicrous to me. Does he have a strong arm? No. But is it THAT pathetic? I don’t think so. MLB.com isn’t as harsh in their grading of his arm either grading it with a 45, which is just below average. 20 and 30 is pretty much saying he’ll have one of the worst arms in the league….. I think that’s a bit harsh. You killed the comments section with your novel. As a Royals fan, I like Dewees as the return on this trade. He looks like he has real potential to be a useful MLB outfielder. I don’t like seeing Mills leave, but even if this trade had been offered by the Cubs straight up prior to the DFA I would have given it a long look if I were in the Royals front office.